Nearly every bit of data we use in our modern devices has a price tag associated with it, but there is one vital piece of technology that many of our devices depend on, that is free. It allows our phones to give us turn-by-turn directions, no matter where we are in the world, and it may one day even facilitate driverless cars. This, of course, is the Global Positioning System, or GPS, for short. This satellite constellation costs upwards of 12 billion dollars to build and launch, yet its service is available for free, worldwide. Well... not really for free. The US taxpayers paid for it, and continue to pay approximately 2 million dollars a day, to maintain and operate the system. But it wasn't always available for use. These satellites were launched for use by the military to provide all divisions of the military with pinpoint accurate location information on their aircraft, ships, and even their individual soldiers, anywhere on the planet. The first Global Positioning satellite, the Navstar 1, was launched in February 22nd, 1978, aboard an Atlas rocket. Over the next 7 years, another ten GPS satellites were successfully launched into orbit. Only one of the twelve planned, Navstar 7, failed to launch. These Block I satellites validated the system's capabilities and the lessons learned from the project were carried forward to the Block II satellites, which would complete the 24-satellite constellation, providing worldwide GPS coverage for the US military. A 24-satellite constellation ensures that at least 4 satellites have a direct line of sight with any point on the planet's surface at all times. This ensures the GPS constellation can pinpoint your location anywhere on Earth through trilateration. We know exactly where the satellites will be at any time as a result of predictable orbits, and a ground station regularly checking in to make sure they are where we expect them to be. 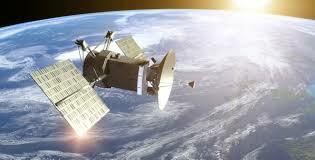 GPS satellites constantly broadcast a radio signal which the GPS receiver in your phone is constantly listening for. This signal tells your phone the satellite's position, and what time it was sent at, thus allowing the receiver to calculate how far away it is from the satellite, as the radio signal travels at a known speed - the speed of light. Each satellite tells us we are within X kilometres, and thus we know we are somewhere on the circumference of a sphere with a radius equal to that distance. Getting this information from 4 satellites allows us to pinpoint exactly where we are on Earth by combining each sphere, and seeing where they intersect. Knowing the exact time is essential to making this system accurate. A divergence of 20 to 30 nanoseconds would make the distance measurements unacceptably inaccurate, so each satellite contains an atomic clock, the most accurate timekeeping device available, but, due to their size and cost, these cannot be used in phones so the GPS satellites also constantly update the phone's time to ensure it is able to calculate the distance between itself and the satellite accurately. To keep this time measurement accurate, we even have to consider the effects of special relativity, because the receiver on the ground is moving slower than the satellite in orbit, which is travelling at 14,000 kilometres per hour. Special relativity predicts that the onboard atomic clock will experience time slower and thus fall behind the clocks on the ground by 7 microseconds a day. Furthermore, the satellites are orbiting at 20,000 kilometres above the surface of the planet, where the gravity of Earth has less effect on the curvature of spacetime. General relativity tells us that the clocks closer to the mass of Earth will fall behind the ones in orbit, so, if we calculate the time dilation due to gravity on the Earth's surface, and then calculate the dilation at 20,000 kilometres from the planet's surface, we can see that the clocks will diverge by 45 microseconds every day. Combining these effects, we have to make the clocks onboard each satellite to tick 38 microseconds faster than those on Earth. If this effect wasn't taken into account, GPS calculations would lose 10 kilometres of accuracy each day making it completely useless, but, thanks to the efforts of those ingenious engineers and Einstein's incredible discovery, we have a Global Positioning System on our smartphones with an accuracy within about 5 metres. But, as said earlier, this system wasn't always available to the average citizen; it was for military use only. To open this system up to the public would open a tool that could potentially be used against the US. After all, missiles used this system for navigation, too. The incentive to open its use for civilian use came in 1983 when a Soviet Su-15 shot down a Korean passenger jet that strayed from its intended route, into Soviet prohibited airspace. An error that could've been avoided had the new form of navigation been available. And so, on September 16th, 1983, president Ronald Reagan announced the Global Positioning System would be made available for civilian use, free of charge. But, there was a catch: the signal would be scrambled to decrease its accuracy to around 100 metres, making it useful, but not by today's standards. This was intended to keep the US military's tactical advantage, and prevent the system from being used for nefarious purposes. It wasn't until 2000 that president Bill Clinton signed a bill to stop the scrambling and open accurate GPS to all civilians, including those outside of America. This was done in recognition of the huge economic benefits GPS could provide to companies in America. American armies have disrupted the signal in the past in areas like Iraq by blasting out radio waves that disrupt the radio waves incoming from the satellites, and this isn't a difficult thing to do. In 2013, a truck driver in New Jersey wanted to mask his GPS location from his boss and used a small jammer, but inadvertently interrupted GPS navigation systems in Newark Airport every time he drove by. Beyond this simple jamming technique, which is easy to track, the US could simply choose to take away this privilege at any point, and cripple businesses across the world. So, countries around the world have been building their own GPS systems. Russia has its own 24-satellite constellation, and so does not depend on the US at all. A similar system will be available for China and Europe in 2020, while Japan has 2 satellites in orbit to increase GPS availability in its urban counties. These satellites' orbits have been tailored to ensure that one is directly overhead at all times. Finally, India has 7 of its own satellites to cover India's land area alone. This tool is probably one of the most underrated results of the space program. A simple radio signal that allows our farmers to operate driverless tractors to manage their land. Commercial fishing vessels use it to navigate, and find fishing locations. The aviation industry uses it for navigation, and collision avoidance. Even drones would not be possible without it, as anyone who has flown a DJI drone knows that you have to have a connection to at least 6 satellites to fly.